SambaDá “RITUAL” New album release for 2015! SambaDá is proud to announce the release of a brand-new album, “Ritual”. Celebrating the sacred ritual of making music together, and honoring the Afro-Brazilian roots of their music, “Ritual” is a joyful exploration of Brazilian rhythm and melody, while referencing a myriad of other musical influences such as reggae, funk and cumbia. “When we play music, we are asking for the blessing of our ancestors,” says lead singer Dandha Da Hora. “Music is our ritual to bring messages of hope, love, equality, and freedom”. Papiba Godinho, lead singer and guitarist, adds that “playing music is more than a jam for us, it is a sacred space where we can express ourselves, and hopefully share this freedom with our audiences and listeners”. All 11 tracks are original music composed by Papiba Godinho and SambaDá, though some tracks also feature folkloric songs, such as the title track “Nesse Ritual”. The track “Na Ladeira” was co-authored and arranged by Bahian percussionist Marcio Peeter, a member of SambaDá who now lives in New Orleans. It pays tribute to the Brazilian art form capoeira, of which Papiba is a Master, and is accompanied by a chorus of capoeristas from Papiba’s capoeira school Raizes do Brasil. “White Toyota”, a playful song with lyrics in English and an infectious Bahian beat, is co-written by Godinho and Gary Kehoe (drumset). The songs on the album highlight the soulful vocals of Papiba and Dandha, whose voices combine beautifully together, and are supported by the rich instrumental textures of the rest of the band. The rhythm section is lead by tight grooves and the expertise of longtime drumset player Gary Kehoe. “Ritual” features the current touring line-up of SambaDá and is SambaDá’s first album featuring bass player Etienne Franc. Franc adds his nimble touch to the samba tracks and hits a deep groove on the funk, reggae and cumbia lines, connecting easily with Kehoe’s drumset. Saxophone/flute player Anne Stafford contributes dynamic horn writing and arrangements and expressive solos, which reflect her passion for Brazilian music and jazz. Percussion is the heart of what SambaDá does. Ritual is also the first album to feature new member Senegalese drum master Ibou Ngom on djembe, sabar, and talking drum. “Playing with Ibou reconnects us with the African roots of samba. It is beautiful and healing, and Ibou is such a master at what he does,” says singer Dandha Da Hora. Will Bates-Minou is also heard adding his extensive percussive vocabulary to the rhythm section, joined by SambaDá veteran Will Kahn on percussion and electric guitar. Will Kahn also engineered the album, together with Rich Williams of Paradise Studios. Bay Area residents Wagner Profeta and Abel Damesceno, both from Salvador, Bahia, Brazil, and both of whom have toured with SambaDá, join in the percussion section to add the undeniable groove of Bahia which powers the entire album. “Ritual” also features the participation of some very special guests. On four tracks the incredible pianist Tammy L. Hall adds her exquisite touch on keyboards, piano and Rhodes. Tammy L. Hall is a renown jazz and gospel artist, who has also a deep love for Brazilian music. Noted Bay Area trombone player Alan Williams (Afro Funk Experience and Afrolicious) and trumpet player Jon Cavanaugh (Flor de Caña) join saxophonist Anne Stafford to create the rich sound of a full horn section on several tracks. 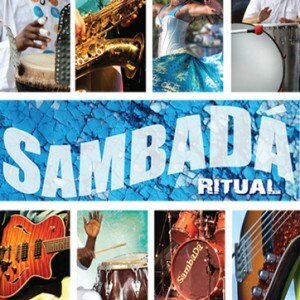 In keeping with SambaDá’s high energy live shows, “Ritual” is danceable and uplifting and yet also has deeper resonances. It is a tribute to the passion of samba and to the band’s dedication to sharing the cultural heritage of Brazil as it intersects with the world.